Today is the 3rd of Elul, which is 9 days from the day I become a full Member of the Tribe. I have been reading about Elul this week, on Anna’s Jewish Thoughts and Jewels of Elul. 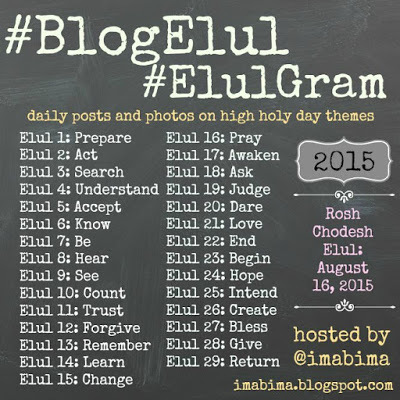 And it occurs to me that Elul is a time of preparation – and I am preparing. Not just for the beit din and mikveh, but for the High Holy Days, of course. Every Jew is, in their own way, preparing for those. Today’s theme, if you will, for 3 Elul is “search.” We can search outside ourseives or inside ourselves, but to search – to seek, if you will – is so much a part of me that it’s part of my blog name (“shocher” – שׁוֹחֵר – means “seeker”). Once I meet with the beit din, I will have no further doubt that God exists. Once I meet with the beit din, I will have no doubts about being a Jew. Once I meet with the beit din, I will have no doubts, period. I’m sure you can see how that’s not realistic. Everyone doubts. “Doubt is the handmaiden of truth,” as the meditation from my best friend’s siddur warned me. But how does this connect to seeking or searching? Well, seeking includes doubting. It includes not being sure. And it includes something I’ve never been comfortable with: being comfortable with not being sure. I have so much baggage between my religious upbringing and having been abused by an emotionally disturbed parent, not to mention being autistic, that doubt has always been something I’ve been afraid of. Even as a scientist, while seeking answers about social problems from my data, I have fought the possibility that my answers might be wrong. I have fought the possibility of doubt. If the beit din asks me what Judaism has given me, I know one thing that I will be able to tell them. Being able to say “I’m not sure,” being able to say “I don’t know” – these are priceless things to someone like me. Because even now, saying “I’m not sure” or “I don’t know” makes my stomach clench with anxiety. But it’s not as bad as it used to be for me. Not nearly. Because now I have Judaism, and Judaism both allows me to doubt and more or less expects that I will doubt. I’m not going to be punished for doubting, or arguing, or having a different opinion than the Jew sitting next to me at Torah study. That’s both expected and encouraged. So becoming a Jew has given me, among other things, permission to doubt and not feel like I’m going to go to hell for it – either literally or figuratively. Every now and then I still have doubt that God exists. Every now and then (usually when I see something egregious or upsetting inside the Jewish community) I have doubts about being a Jew – not doubting that I want to be a Jew, or that I am a Jew, but that I can accept that Jews who attack others are still Jews too. In Christianity it was always the opposite – if they attacked people they weren’t a “real Christian.” Judaism does not give me this “No True Scotsman” dodge. But the people that I’ve written about here on my blog, who’ve made me worried and made me doubt, are also Jews. By making it formal and official that I’m a Jew, I’m also declaring a connection to them, however reluctant I am about that aspect of it. For me, acknowledging that I will be part of one of the most hated, persecuted, and reviled groups on the planet is easy compared to acknowledging that I’ll be part of a group that includes people like the ones who burned down that Palestinian baby’s house and burned him to death, or murdered that young woman at Jerusalem Pride. But I’m still going to do it. Why? Well, that’s another thing that Judaism has given me as I’ve been searching for these last eighteen months and more: a name for my drive for justice. Tikkun olam. Healing the world. Tzedek, tzedek tirdof. And if my being a visible Jew gives an anti-Semite a moment of doubt, or if my being a visible Jew causes someone to search out answers they might not have considered before, then that’s a step in the right direction. since I am not a Jew yet I was in a situation where I felt I has to protect the Torah in a question a “christian” was asking me about tattoos. (guilty I have a few) and he said something to the fact that it doesn’t pertain to tattoos for “true believers”. I didn’t want to cause any trouble or feel like I was acting out from Yental. Just smiled and wanted to say there is only one G-d and guess what we both believe in the same one!